Did you ever get so mad that you threw a football at your parent’s television set? It’s been 25 years now. This writer graduated from high school in 1976, and missed the epic Game 5 of the NBA Finals that year (Celtics win in triple overtime versus Phoenix) thanks to the fact that that was Graduation night. The nation celebrated the Bicentennial in July, and I left home for the party-crazed atmosphere of UMass in the fall. Christmas break (at UMass it was called “intercession”) set in, but there was a different feeling in the air other than yuletide. All fall long, Patriot Nation watched in disbelief as their team went 11-3, easily the best season in franchise history. The team was catapulted to this record thanks to a trio of huge wins in September and October. A home win over Miami, 30-14 was followed by a stunning 30-27 win at Three Rivers Stadium over the defending Super Bowl champion Steelers. But the third win was a home trouncing of the Oakland Raiders, 48-17. It remains the most dominating, and one of the most impressive, wins in the history of the franchise. It would be the only loss that season for the Raiders. The Patriots bullied that team all over Schaefer Stadium, running the ball down their throat and killing them through the air. The Boston Globe’s headline was a picture of the scoreboard with the headline “That Says It All”. The 1976 Patriots are the best edition of this franchise in history. Like the two Super Bowl entrants, this team won 11 games. But this team was the most efficient, most dominating, and most entertaining of all Patriot teams in history. Teams that followed that would win division titles were nice to watch. This team was the best. The running attack was the envy of the National Football League. Three Patriot running backs gained 700 or more yards. Sam “Bam” Cunningham, Don Calhoun and Andy Johnson (who actually gained 699 yards, but who cares) formed arguably the most formidable rushing attack the NFL had seen in the entire decade of the 1970s. The fourth leading rusher on the team was some wild quarterback named Steve Grogan, who checked in at just under 400 yards. The team total was 2,948 yards. What was most impressive about that was the average per carry. The team averaged 5 yards a carry. Calhoun had a 5.6 average; Grogan had 6.6. The worst among the regulars was rookie Ike Forte at 4.0. The Patriots pounded the ball back then, with a ferocity and efficiency that neither Craig James nor Curtis Martin enjoyed during their Patriot careers. Opening up those holes was arguably the best left side of an offensive line in NFL history. Leon Gray passed away recently, a player given not nearly enough credit for his great work in his heyday. And you all know about John “Hog” Hannah, who simply played his position better than anyone who ever walked the planet today and yesterday. With Dr. Bill Lenkaitis at center, the Patriots ran left practically at will, and the numbers speak for themselves. Grogan was a better runner than passer. His passer rating of 60.8 for the year was largely due to his low completion percentage (48.0) and his high interception rate (6.6 percent, he suffered 20 picks in 1976). On the other hand, Grogan set an NFL record with 12 rushing touchdowns by a quarterback. Grogan’s propensity for the untimely interception was offset by his toughness and his scrambling ability. And often times, he was more like a bona fide running back versus a Fran Tarkenton look-alike. Defensively, the team was buoyed by two rookie defensive backs. Mike Haynes and Tim Fox were both first round draft picks. Haynes is now enshrined in Canton, and electrified New England in his first season with eight interceptions and two punt returns for touchdowns. Fox was a hard hitter and a headache ball in the secondary. The front seven was unique in that most everyone was named Steve. Led by middle linebacker Steve Nelson, outside linebackers Steve Zabel and Steve King, the Patriot defense featured a great pass rush and adequate run stoppage. Situational pass rusher Tony McGee led the team with 9 ˝ sacks. The Patriots had 47 sacks as a team, and yielded only 19. Despite their 11-3 record, the best the Patriots could do was a Wild Card. Back in 1976, three division winners and one Wild Card made the playoffs. The Patriots lost out to the Baltimore Colts on the tiebreaker (Baltimore had a better divisional record), and had to play their first playoff game since the merger on the road at Oakland. The Raiders figured to have revenge on their mind, the 48-17 pasting at Foxborough the only blemish on their otherwise dominating season. And so, on December 18, 1976, the Patriots headed out to the Oakland Mausoleum, many years before anyone had ever heard of Network Solutions or the Internet. The Raiders were heavy favorites to win on their home turf. But the Patriots looked the evil Raiders in the eye and stood toe to toe with them. 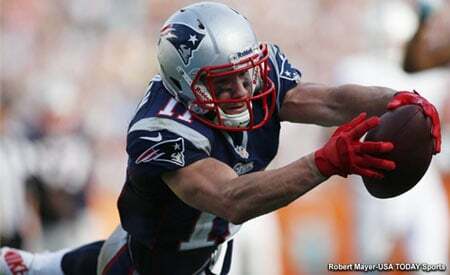 The Patriots drew first blood in the first quarter on a one-yard run by Johnson. The Raiders struck back with ten unanswered points on a 40-yard field goal by former Detroit kicker Errol Mann and a 31-yard pass from Ken Stabler to Fred Biletnikoff. It was 10-7 Raiders at the half. But the gritty Patriots came back, and scored two third quarter touchdowns. Russ Francis caught a 26-yard toss from Grogan to make it 14-10 Patriots, and Jess Phillips scored from three yards out to expand the margin to 21-10. The Patriots were buoyant, and taking dead aim at a huge upset playoff win. A one-yard touchdown run by future Patriot Mark Van Eeghen in the fourth quarter cut the Raider deficit to 21-17. The Patriots got the ball back, and set out to kill off some clock. The first real controversial play of the game soon happened, which is generally forgotten thanks to what would come later. The Patriots drove to the Oakland 30-yard line, and had a third down and less than a yard. Pete Brock, Lenkaitis’ backup center, was flagged for a false start, making it third and six. Grogan tried to hit Francis with a first down catch, but was held by Raider linebacker Phil Villapiano. No penalty was called. John Smith would miss a 50-yard field goal, and the Raiders took over at their own 34 with a little over four minutes remaining. Francis was furious over this non-call. During the offseason, legend has it that Francis took Villapiano and his wife up for a ride in a helicopter out in Hawaii. While up in midair, Francis then turned the copter on its side, with Villapiano only a seat belt away from falling out the open side door. Francis yelled at Villapiano for getting away with a holding penalty that helped cost his team a playoff win. Villapiano needed incontinent pants at the time. The Patriots still had a 21-17 lead, but the Raiders began to drive. The Raiders were in deep trouble, as they faced third and 18 at the Patriot 27. Stabler dropped back and hurried a pass towards former Patriot Carl Garrett at the left sideline. The pass fell incomplete, and the Raiders were faced with a dilemma. Their dominating 13-1 season was in severe jeopardy. Except that referee Ben Dreith had thrown a penalty flag. Raymond “Sugar Bear” Hamilton, later to become a Patriot assistant coach, rushed in from the right side. He came towards Stabler, and raised his right arm to try and knock down a pass from the left-handed Stabler. At the very same time, Hamilton collided with Stabler as the ball was released. Hamilton plowed into Stabler and both men crashed to the ground. Dreith ruled that Hamilton roughed Stabler. The pass was off just as Hamilton crushed into Stabler. The hit was not late, and film footage is crystal clear on this. As for the arm being raised, today Hamilton would have been nailed for a blow to the head, but in 1976 the hit was clean and legal. But Dreith, with a reputation for protecting quarterbacks to a fault, ruled roughing the passer on Hamilton. As coach Chuck Fairbanks howled in protest and threw up his arms in disgust, the Raiders crawled out of the abyss and had new life. They had first and ten at the Patriot 12. A few plays later, Stabler ran around left end and sneaked in for a one-yard touchdown run. As Stabler scored, a very angry youth named Bob George hurled a football at his parent’s TV set in disgust. No damage was done, as the ball caromed off the stand it rested on. But this writer was more angry than a Red Sox loss to the Yankees. This game hurt. It still does to this day. Dreith’s call severely changed the course of the season for both teams. His horrid judgment cost the Patriots a Super Bowl win. With injured Pittsburgh and star-crossed Minnesota off in the distance, the Patriots would have had a cupcake walk to a Vince. Instead, it was the Raiders who took the cupcake walk, with huge wins over the Steelers and Vikings on their way to a triumph in Super Bowl XI. Instead of “Old Man Willie” Brown running that Tarkenton pick back for a touchdown, it would have been “Young Man Mike” Haynes. The ill feelings Patriot Nation feels for Raider Nation has its roots in this game. It worsened two years later, when Jack Tatum blasted Darryl Stingley during an August preseason game, leaving the wideout a quadriplegic, then bragged about it a book entitled They Call Me Assassin. But the call by Dreith, and the loss of a Super Bowl championship that went along with it, haunts the Patriots to this day. The 1976 Patriots was the franchise’s best chance to win a Vince in their existence. The 1985 Patriots ran up against the best one-season defensive team in NFL history, and the 1996 Patriots were riddled by Brett Favre, Reggie White, Desmond Howard, and a coach more dedicated to his next job than his current job. But the 1976 Patriots featured some of the finest work the league had ever seen, and would have won it all if they had been able to hold on and defeat Oakland. The Patriots did exact revenge ten years later, and we’ll tell that tale later this week. Larry Barnett ripped the heart out of the Red Sox fourteen months earlier. Richie Powers made his mark (like a fan made his mark on Powers) six months earlier. Boston teams sure had their run of officials making headlines during this period. And when those officials decide the fate of a team’s entire season, it perverts the legacy of that official, and the shame he or she has to live with their entire life. Officials have done their job when they go through a game totally unnoticed. But Dreith’s call defined his whole career much the same way Barnett’s non-call defined his. To have a call define their career is the biggest detriment to a sports official that can possibly happen. It also provides a paradox of huge proportions. The Raiders became legendary for their cheap shots, many of which led to modifications of NFL rules on defensive contact. But a Patriot defensive lineman lays a clean hit on a Raider quarterback, and a resulting penalty deprives the team of a likely Super Bowl win. If the first led to the second, George Atkinson would take the punishments…and the Vince…any day. That is why any Patriots/Raiders playoff clash means a little bit more than advancement to the next round. Al Davis and Bucko Kilroy remain from the 1976 fiasco. Bloodlines still exist. Hurt remains. As do memories of what was to have been a Super Season, shattered by a phantom official’s call. And the dreams of what might have been for the greatest Patriot team ever. This entry was posted in Uncategorized on January 16, 2002 by Bob George.